REINER HEBE, MODERN CLASSIC ARTWORK, IS A NEW INTERIOR OBJECT COLLECTION THAT I HAVE DESIGNED MYSELF. WHEN I CREATE MY WORKS OF ART, THREE THINGS ARE ESPECIALLY IMPORTANT: BRINGING BEAUTY INTO THE WORLD, A CERTAIN UNIQUENESS, AND VALUES THAT PRACTICALLY LAST FOREVER. PRODUCING EMOTIONAL OBJECTS, THAT MAKES PEOPLE HAPPY AND HAVING DEPTH FEELINGS TO THIS EXCEPTIONAL QUALITY, IS BOTH A MISSION AND A MESSAGE. MY WORK IS A FUSION OF CLASSICAL FORM AND MODERN STYLE. THE INTERPLAY OF THESE CONTRASTS RESULTS IN EXTRAORDINARY COMPOSITIONS AND A NEW DESIGN LANGUAGE THAT IS ABSOLUTELY DISTINCTIVE. EACH* OF THESE EXCLUSIVE ARTWORK OBJECTS HAS BEEN PRODUCED IN GERMANY, AND MOST ARE MADE BY HAND. WE CAN CUSTOM - MADE AND CONSTRUCT ALL PIECES ACCORDING TO YOUR INDIVIDUAL WISHES. 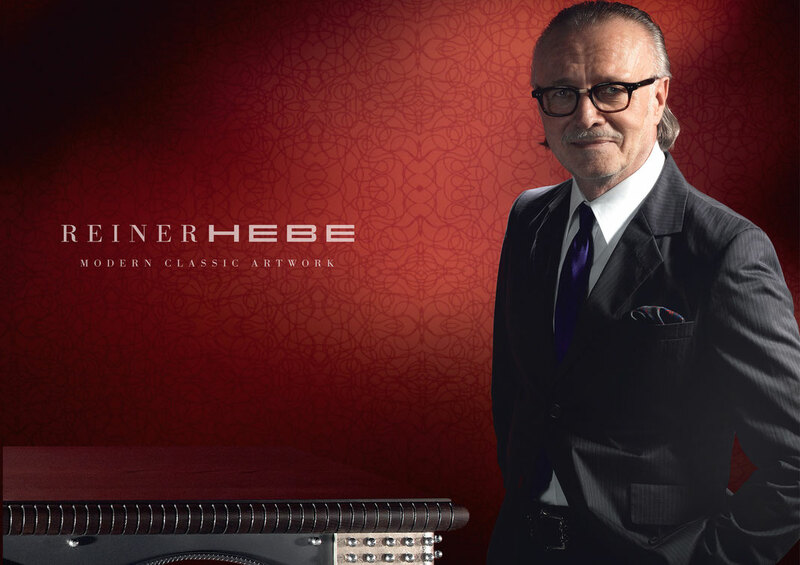 REINER HEBE, DESIGNER AND FINE ARTIST, HAS RECEIVED AWARDS FROM THE ART DIRECTORS CLUB NEW YORK, TYPE DIRECTORS CLUB NEW YORK, ART DIRECTORS CLUB GERMANY, RED DOT DESIGN, CLIO AWARDS NEW YORK, THE GERMAN AWARD FOR COMMUNICATION DESIGN, NEW YORK FESTIVAL, AND MANY MORE.